Forget “Chorus Line” or the many recent dramas about dancing in the corps de ballet. Being part of the group who normally back up the leads doesn’t mean being anonymous. Price Suddarth’s newest piece, “Signature,” explores that dynamic of the dancers as individuals contributing to the art. “Simply being there is the dancers’ signature,” he explained. “No signal characteristic is unique—it is our entire person that makes us unique.” Of course being tapped to create a new work for a distinguished company's mainstage program when you’ve been dancing there for only five years might be counted as little more unique than normal. Suddarth became a PNB apprentice in 2010 and transitioned to the corps in 2011. Suddarth choreographed his first piece while still a student at the School of American Ballet. “It was really small but fun. I realized that this is a puzzle that I enjoy.” Once employed at PNB, he participated in the company’s Next Step program, where the company's dancers choreograph new works for PNB School's Professional Division students. Suddarth was invited to present his works at the 2012 Regional Dance America Gala performance and at the 2014 Chop Shop: Bodies of Work Contemporary Dance Festival. 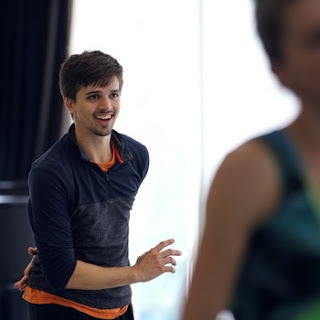 This year, PNB artistic director Peter Boal asked Suddarth go one farther and create a new work for the company’s fall mixed rep program of modern works, putting Suddarth on the same footing as choreographers Kiyon Gaines, Jessica Lang and Crystal Pite. The final work incorporates an original score by Barret Anspach that “sounds as if Vivaldi was writing music in 2015,” said Suddarth. Elegant black costumes were designed by Mark Zappone and lighting by Randall G. Chiarelli add to the mood. Back in the studio, explaining his ideas to the dancers in “Signature,” Suddarth also discovered that “it takes a lot more effort to have words coming out of my mouth than talking with my feet. I’m a visual learner but as a choreographer I have to verbalize what I want.” But the talking is coming easier and faster these days as he thinks ahead to creating more works as well as dancing in new pieces. “I feel so much more in control,” he said.